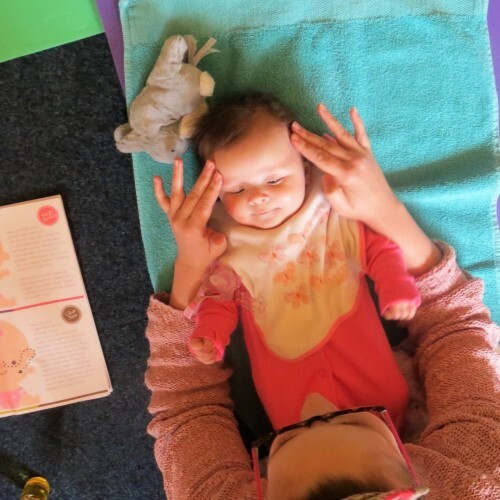 Loving Hands run baby massage courses spanning 5 weekly sessions, covering a full body massage routine for you and your baby to enjoy in a relaxed and friendly environment. Baby massage has many benefits including reduced crying, less fussing, and better sleeping patterns. It also enhances the bonding process by spending quality one on one time connecting with your precious little one. The massage routine includes strokes to help relieve symptoms of colic, wind, constipation, congestion and teething, which can be very stressful for both parent and baby. Sessions also include an element of sensory play for the babies and leave plenty of time for mummy or daddy to relax with refreshments and some adult conversation. Classes are for babies aged from 6 weeks to active crawling. You will be provided with everything you need including: mats, cushions, your own bottle of organic massage oil and detailed digital handouts for you to keep, so you can practice and continue what you have learnt after the course has finished. All you'll need to bring is your little one, along with their feeding and changing requirements and a towel. To start relaxing with your baby, find your nearest class here and book a course with your Little Starts gift card.